'Indian and Iranian sources both confirmed to me that India and Iran are moving ahead to implement a payment system on buying oil from Iran and hope to finalise it very soon,' says Aveek Sen.
Iranian President Hassan Rouhani, in a speech delivered at Tehran University to mark the beginning of the new academic year, said the Trump administration wants to bring about a 'regime change' in Iran using the tool of economic war. Iranian First Vice President Eshaq Jahangiri downplayed the possible future impact of US sanctions that will roll out on November 4. Much before the US's November sanctions, Jahangiri sai ,some clients had stopped buying Iran's oil, but Tehran had still found new buyers for its crude oil. In a hint at India (and China among others), Jahangiri said Iran is in talks with 'its traditional partners' to find ways to bypass US sanctions. Who these traditional buyers of Iran's oil are will be clear after the implementation of US sanctions in November, Jahangiri added. The Trump administration has called on all buyers of Iranian oil to cut imports to zero. However, analysts in India feel that what the US wants is only a reduction in Indian oil imports from Iran. Indian government owned oil companies don't seem likely to halt their imports as India only recognises United Nations backed sanctions. Moreover, it isn't technically feasible for oil importers to implement the sanctions within a few months of the US announcement. However, private sector oil companies, due to their exposure to the US financial system, have cut down imports drastically -- and that is what the US desired and not actual zero oil imports from Iran. US Secretary of State Mike Pompeo stated last month that Washington would consider waivers on the embargo, adding that these waivers would be time-limited, if granted. The recent OPEC discussion with Saudi Arabia and Russia over a production increase (which also created some discomfort in Iran over Russia's stance), also signals that notwithstanding US demands, it can't dent Iran's crude oil sales by any significant scale. Last week, oil prices rose to a four-year high with Brent crude crossing $86 per barrel. Iran is India's third-largest supplier of crude oil, after Iraq and Saudi Arabia. According to the Press Trust of India, Prime Minister Narendra Damodardas Modi will brainstorm with chief executives of Indian oil companies on the emerging energy scenario, with the ripples from US sanctions on Iran and volatile oil prices threatening India's growth. "I think Iran will turn again to the east. Not only will our trade with India, China grow, but we'll see significant growth in our trade with South East Asian countries such as Indonesia," Mojtaba Mousavi, editor, Iran's View, an Iran-based Web site covering Iran's domestic and international affairs, told me. "Iran-India cooperation during the last round of US sanctions were fruitful," Mousavi added, "though some problems were experienced. For example, India forced Iran to barter oil for certain Indian goods, none of which was needed in Iran." "On the other hand," Mousavi pointed out, "ndia's slow progress and reluctance to fast-track the development of Chabahar port were used as a ruse by pro-Western elements in Iran to force the system to go with the Europeans after JCPOA (Joint Comprehensive Plan of Action or Iran's nuclear deal with the West struck by the Obama administration)." "With regard to India," Mousavi said, "I believe Iran missed the opportunity after the JCPOA to prepare the ground for easier cooperation with its traditional partners. For example, if we had established a currency swap with India along the lines of what was done with Turkey, we would have had better days now." "Thanks to the currency swap agreement with Turkey," Mousavi pointed out, "all of our trade will be based on the rial and lira, no dollars will be involved, and it will be immune from US banking sanctions. Russia and Turkey also went for a similar solution to confront US sanctions." Oil Minister Dharmendra Pradhan has said that two State refiners have placed orders to import crude oil from Iran in November. New Delhi did not know if it will receive a waiver from US sanctions, Pradhan said, adding that the government is considering evolving a different payment system to import Iran's oil. It could pay using Indian rupees in an attempt to dump the US dollar. Indian Oil and Mangalore Refinery have contracted to import 1.25 million tonnes of Iranian oil in November, the month when US sanctions against Iran's oil sector kick in. Indian Oil, newspaper reports said, will importing the 'usual' monthly volume of oil from Iran. 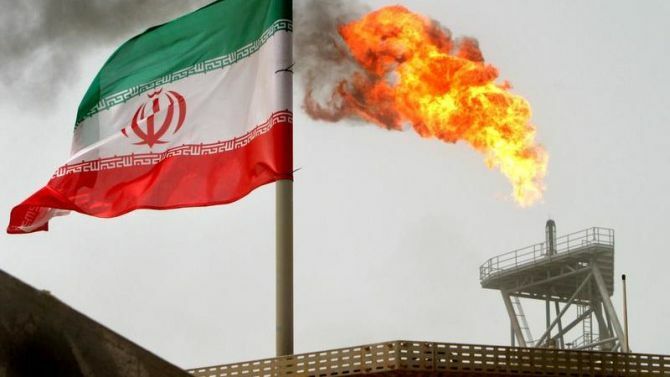 It had planned to import 9 million tonnes of Iranian oil in the 2018-2019 fiscal (April 2018 to March 2019) or 0.75 million tonnes a month. This is in line with how Indian observers see the US sanctions, not as a blanket ban. In the coming weeks, it will be clear what the US actually means by zero oil imports from Iran. My sources tell me a favourable waiver from the US is expected. Indian and Iranian sources both confirmed to me that India and Iran are moving ahead to implement a payment system on buying oil from Iran and hope to finalise it very soon. Will Modi risk US sanctions and buy oil from Iran?